"Cold hands, cold feet x 4"
OK, less whining about the weather today. 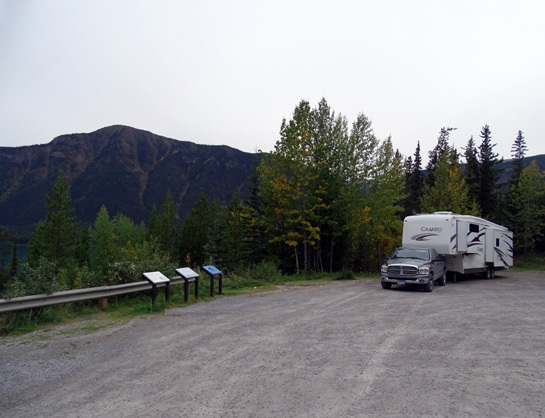 Today we drove on the Alaska Highway from Whitehorse, Yukon to a large pull-off at the north end of Muncho Lake, British Columbia at KM 712/Historic MP 463. 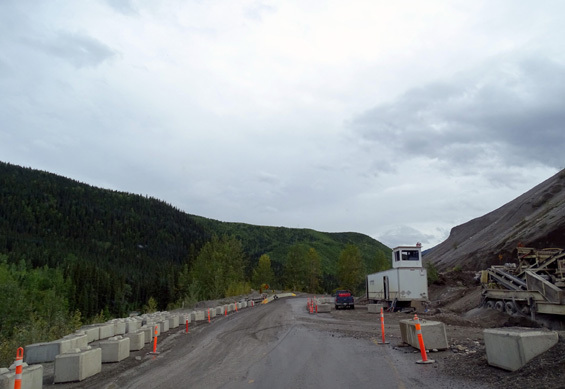 That looks like a lot of miles with a big rig on the Alaska Highway but we did it in just nine hours with several stops and some road construction. 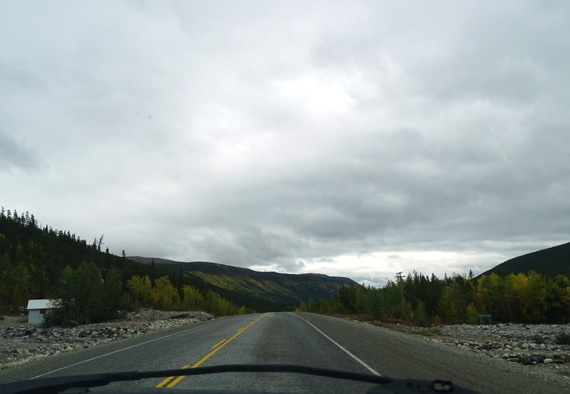 The road was less remote today and we were able to drive faster. We weren't sure how far we'd get today. We reached Watson Lake at 2 PM and didn't want to stop that early. We made such good time that we kept going several more hours. We stopped at two different pull-offs to fix lunch and walk the dogs and got diesel at the Tags/Tempo station in Watson Lake for $1.059/liter Canadian. 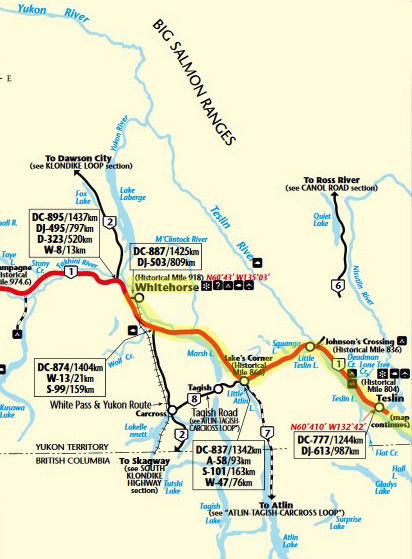 in June, 2012 and shut down the Alaska Hwy. for an unprecedented five days. The highway was mostly in great condition today. 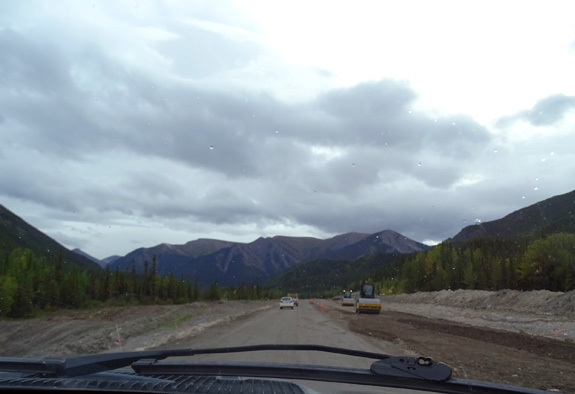 Several miles of roadway are being realigned along the beautiful blue Trout River. They are realigning it and doing a lot of work on the river banks -- must be a problem with flooding. They started working on this section after we came through here in early June. 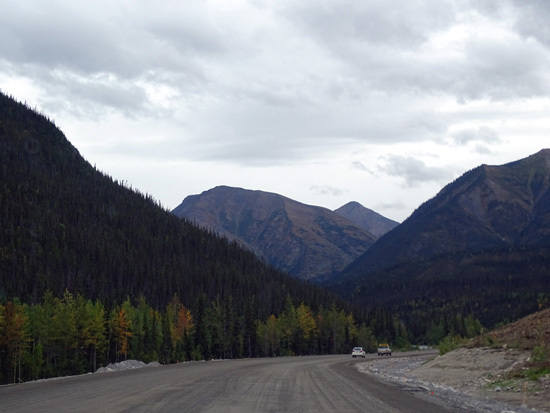 Then there was a 52 Km section of chip sealed pavement with dust before and around Muncho Lake, where we spent the night. We like dust better than mud! Long view of road with no traffic -- love it! Traffic was minimal. There were very few passing lanes up hills but no one who wanted to pass had to wait more than a mile to do so. We saw quite a few RVs going in each direction again today. Some were probably just out for the weekend, not going home in Canada or the Lower 48 from Alaska. 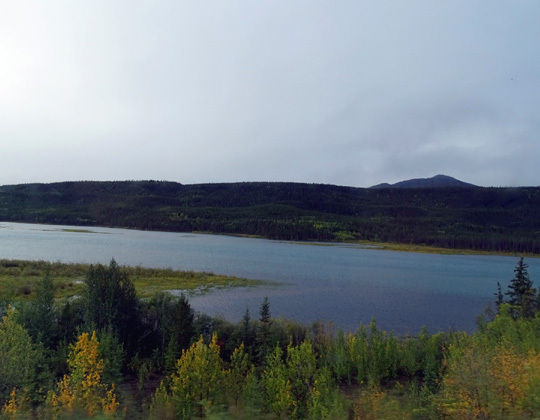 It was cold (low 40s F.) and raining when we left Whitehorse. Overnight low was 41 F. and rain/snow is predicted there for tomorrow! When Jim got into the truck to leave this morning he told me to write down "cold hands, cold toes x 4" to remind him not to come back up here again. 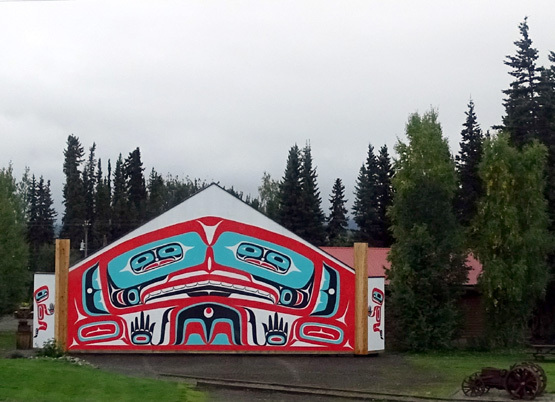 I wouldn't be surprised if he never wants to visit Alaska again, even though we had a good time and better weather for most of this trip than we did in 2012. I reminded him that the high in Great Falls today and tomorrow will be about 92 F. (then it drops to the low 80s and upper 70s before we get there.) That is probably what motivated him to drive so many miles today -- he's looking forward to some warmer, drier weather! 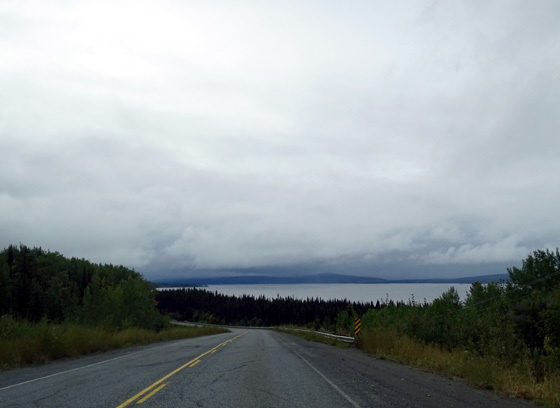 We had intermittent showers until we got to Liard Hot Springs (i.e., most of the way today). 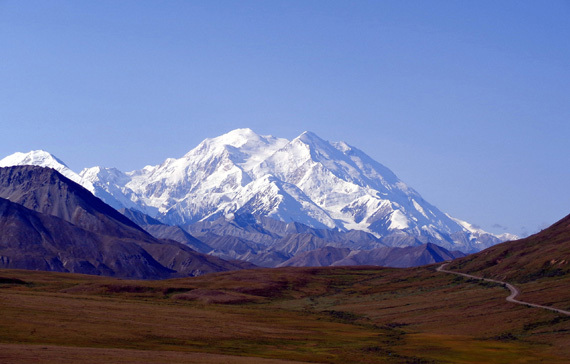 The clouds were higher today, though, so we could see more mountains and farther into the distance. It was mostly overcast and in the upper 50s F. during the afternoon. We did get some glimpses of the sun along the way but not for long. It was bright enough to charge up our batteries pretty well with the solar panels in transit. We didn't have to use the generator much this evening except to fix supper in the microwave and recharge the batteries before bedtime. 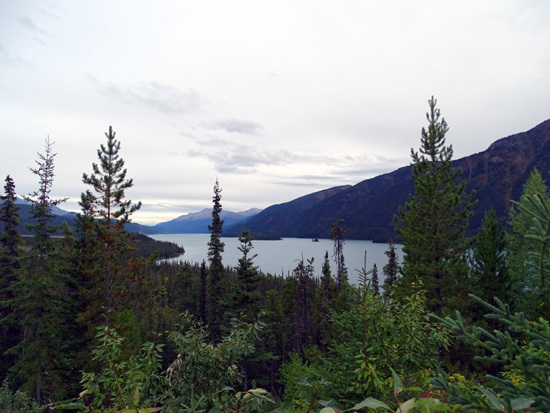 We had no rain in the evening at our overnight rest spot at Muncho Lake, and no wind. Elevations ranged from 1500+ to 3200+ feet before and at the Continental Divide. We were mostly above 2,200 feet all day. 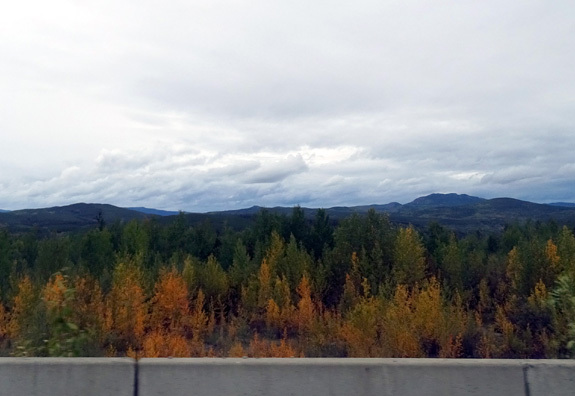 We drove more east than south today but there was less fall color than yesterday and very few patches of red fireweed stems and leaves. 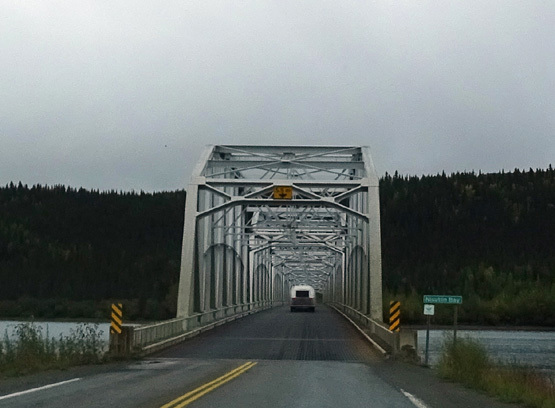 We crossed the long Nisutlin Bay bridge with no incident. 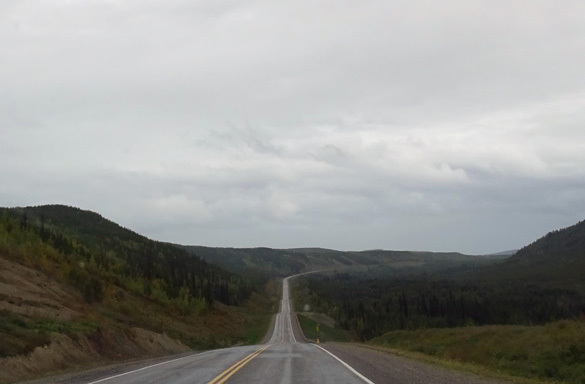 At 1,917 feet, it is the longest water span on the Alaska Hwy. 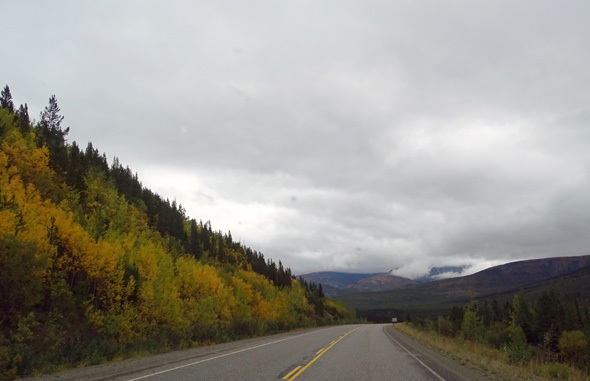 As we neared the Cassiar Hwy. intersection before Watson Lake the sky was brighter and it wasn't raining. 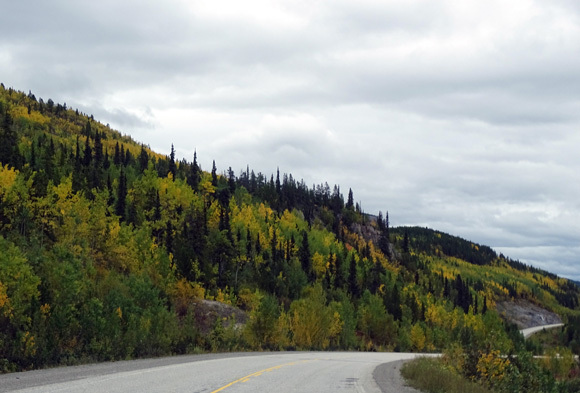 It was tempting to turn south and follow our original plan, but we continued on the Alaska Hwy. because the weather forecast is much better that way right now. So are road conditions. 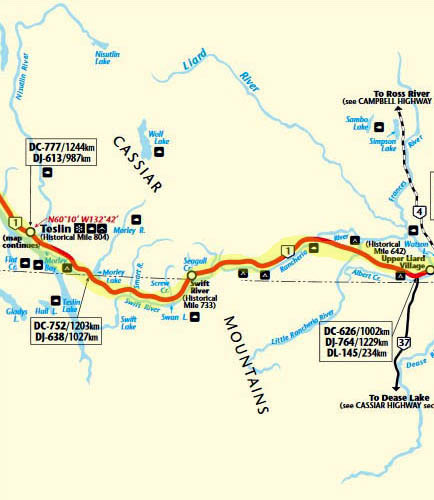 We plan to go to Banff-Jasper National Parks and Stewart-Hyder another year, preferably in the fall when the bears are there (the salmon run late August to early September). Of course, we said that last time when we didn't go that direction and we haven't done it yet . 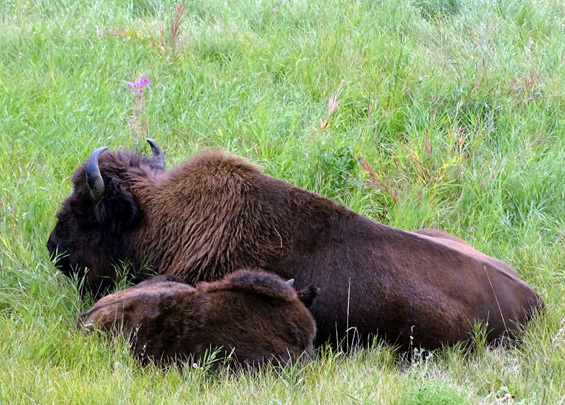 . .
Until this afternoon we've seen zero big wildlife on the Parks, Richardson, or Alaska highways since we left Denali -- another disappointment. 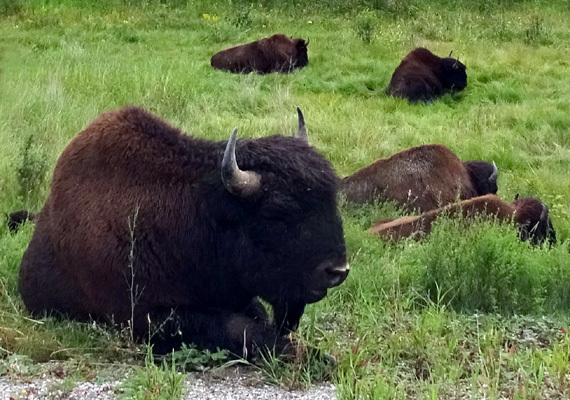 But in the section of the highway that dips down into British Columbia after Watson Lake, then back up to the Yukon border briefly again, and between the Coal and Smith Rivers in BC, we saw over 100 bison in singles, pairs, and two herds. 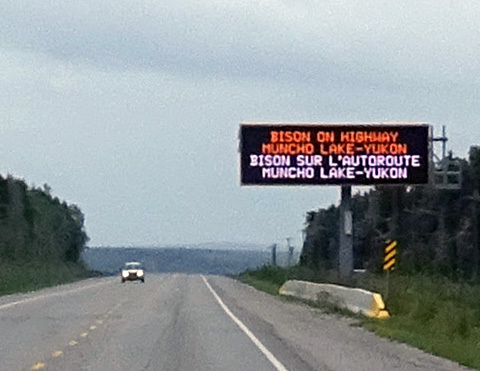 just English is official in the Yukon and Alberta. 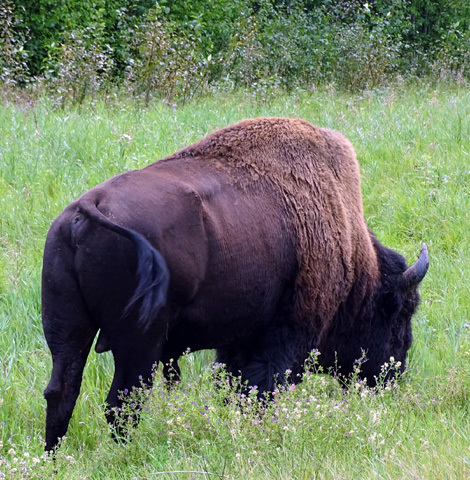 One herd must have had 70-80 bison in it. We stopped at that one in several spots so I could take multiple photos. 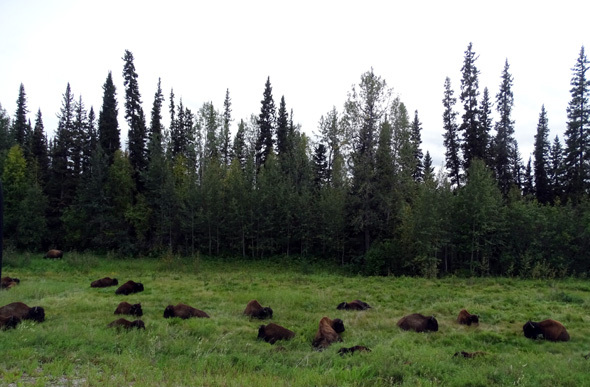 A couple previous times when we've passed through this area we've had to stop for one or more bison in the middle of the roadway. You wouldn't want to hit one of those! 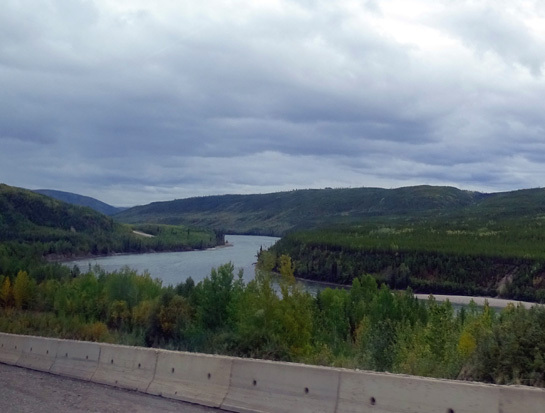 We've also seen stone sheep between Liard Hot Springs and Muncho Lake but didn't see any of those today -- maybe tomorrow as we continue past the lake. 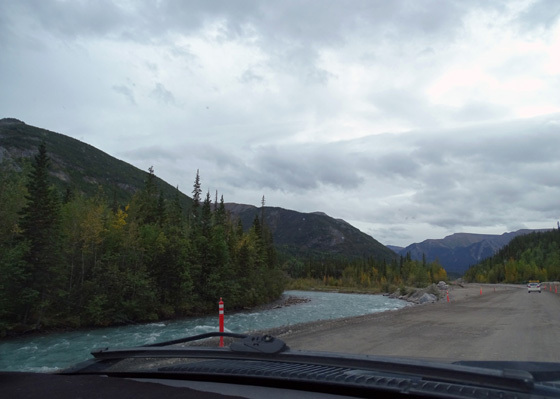 The large crushed gravel viewpoint is off the road far enough to be quieter than most pull-offs. We hope to reach Great Falls, MT on Tuesday -- four more days on the road -- see what the weather is like (too much smoke from wildfires still? ), and decide how long to stay there. 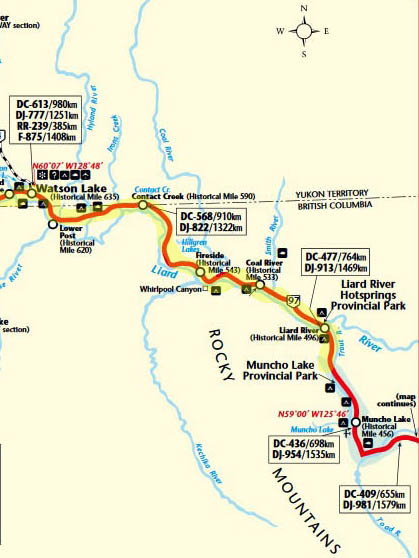 The plan for tomorrow is to drive to Charlie Lake just north of Fort St. John, BC and stay at the Rotary Club CG again. It's good to have electricity, water, and WiFi every other day. Cody is getting better. He is still wobbly but wants to walk farther and hasn't fallen down today. He was playful tonight when I got on the floor with him; he loves to wiggle around on his back and get massaged along the spine.